Now, I am a little late to the party with this one, but with the recent miserable weather we have had lately, I felt I needed a little hint of Summer to perk me up. So, here is the L'Oreal x Camila Cabello Havana range. This wasn't such a big deal in England, as we never seem to get as many collaborations brought over here compared to the US, but this was everything over there and I managed to pick up some bits whilst I was in Orlando during November. L'Oreal has recently become one of my favourite drugstore brands, but again, unfortunately they release a lot more products in America than what we see over here. The collection does contain other products, but these are the ones that caught my eye the most. Starting with the L'Oreal x Camila Cabello Havana Sun-Lit Bronzer, this comes in two colourways - Light/Medium and Medium/Dark. I picked both up as I knew I could then use the lighter shade in Autumn/Winter, and the warmer shade in Spring/Summer. I find the packaging so Summery, with its pop of mint green, pink blooms and gold touches, it cheers you up just looking at it. 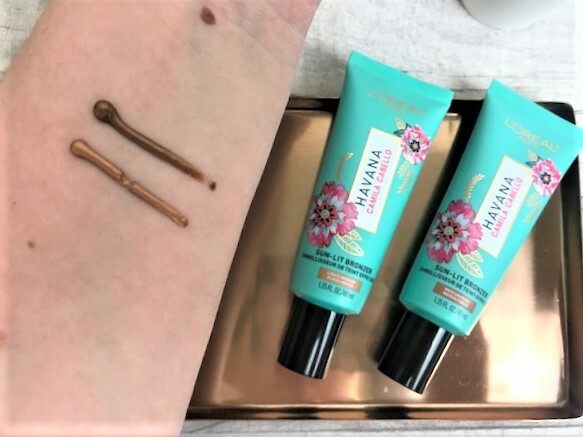 The product itself comes in a squeezy-tube with a narrow point so that you can control the amount of product coming out and texture-wise it is a liquid bronzer, but feels slightly gel-like when it first comes out of the tube. 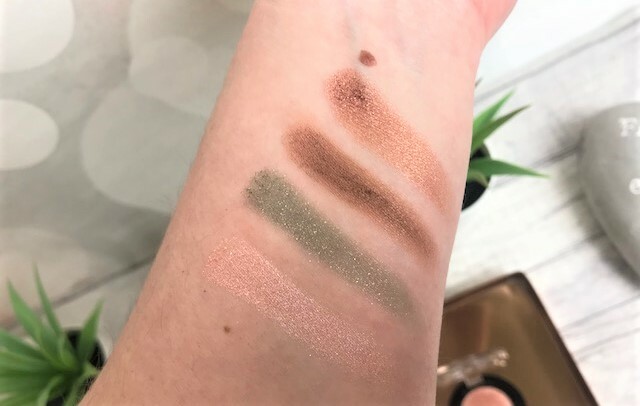 As with all liquid bronzers, the colour can look a little scary at first, but it blends in beautifully to create a very pretty, healthy glow to the skin. Moving on to my favourite part of the collection - the eyeshadows! There are four to choose from, and each one is totally different from the other so there is something to suit pretty much all skin tones and colourings. The shadows come in individual clicky pans and the packaging is nowhere near as stunning as the bronzers unfortunately. 01: In Love - A soft, baby pink full of shimmery silver micro-glitter. 02: Hot Havana - By far the sparkliest shadow. Full of gold and green glitters. 03: Control - A warm bronze shimmery shadow. 04: Oh-Na-Na - A rose-gold shimmer which looks perfect with blue eyes. I found the eyeshadows super soft and easy to work with. 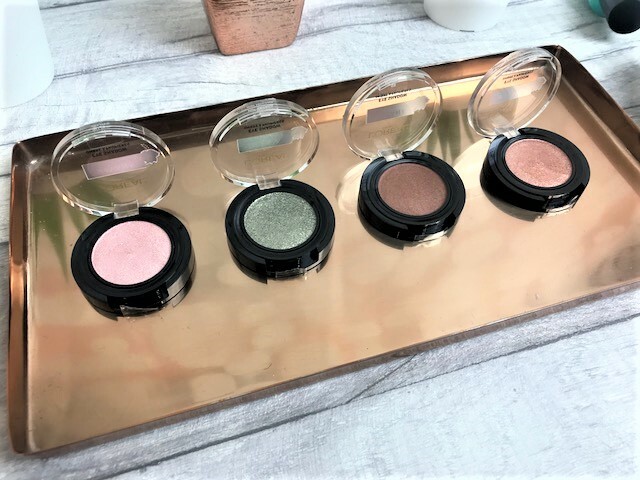 You only need a small amount of product to create full-coverage with these and they really do look stunning in real-life - I always think that when it comes to shimmers and glitters, they don't always photograph as well. 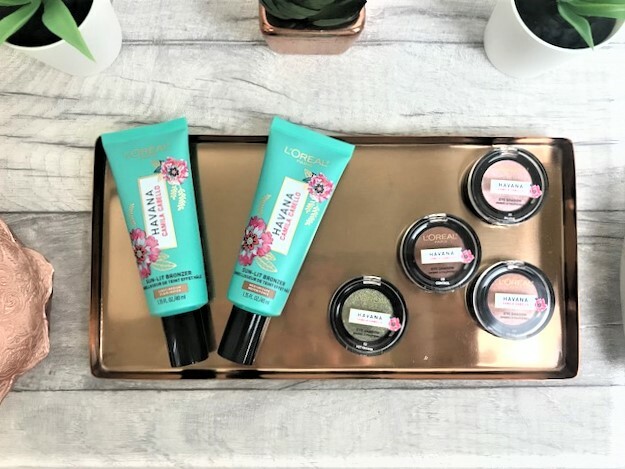 Even though I got these in America, I did manage to find them online at Pretty Little Thing, where the products are currently on offer and you can get the Bronzers for £6 each and the Shadows for £4-4.50 each.